Our TBL - 101 Alluminium Anodised Cloth Rolls is known for its sturdy construction and flawless functionality. 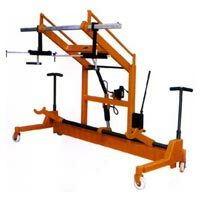 The trolley is ideal for lifting & transporting warp beam from floor & to put it on the loom. Our Alluminium Anodised Cloth Rolls is available in different widths & lifting capacities. We make available Alluminium Anodised Cloth Rolls in bulk and at market leading rates. Alluminium Anodised Cloth Rolls Model TBL -101 Technocraft Alluminium Anodised Cloth Rolls are... 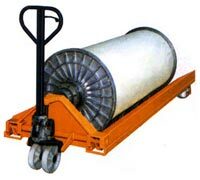 Ideal for lifting & transporting Alluminium Anodised Cloth Rolls from floor & to pat it on loom. 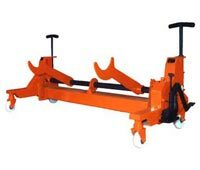 Available in different width & lifting capacity. Twin Alluminium Anodised Cloth Rolls with Harness Mounting Arrangement Suitable for lifting twin warp beams along with harness frames mounting arrangement. 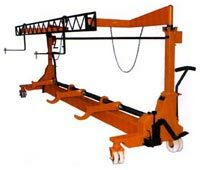 Suitable for loom width up to 380 cm & carrying capacity up to 2000 kg. Pallet Type Pallet Type Alluminium Anodised Cloth Rolls Model TBP-108 Model TBP-108 For easy & smooth movement of warp beam from floor to floor. Suitable for beam width up to 3800 mm, beam flange diameter from 800 to 1250 mm.